For over a decade now, Brazil's POWER FROM HELL have been something of a cult institution in the metal underground. 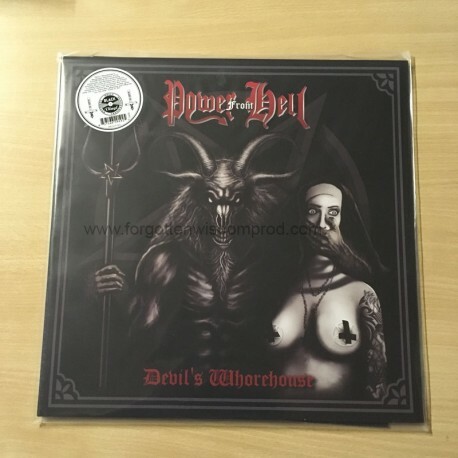 Their four albums to date have been highly coveted for their unapologetic simplicity and sinister aura, and now longtime fans HELLS HEADBANGERS step in to unleash their fifth album, Devil's Whorehouse! In many ways, Devil's Whorehouse is the perfect distillation of the POWER FROM HELL experience: immediately headbanging mini-anthems extolling the virtues of every evil, all draped in deliberately crude production that oozes atmosphere. Naturally, the band's moniker gives some clue as to where their allegiance and influences lay, but other "Class of '84" names like Bathory, Hellhammer, Japan's Sabbat, and very early Slayer should spell in no uncertain terms what kind of black METAL the duo of Sodomic and Tormentor favor most. But it's the ghostly yet still-aggressive aura surrounding Devil's Whorehouse that really sets POWER FROM HELL away from the pack, and closer to primitive isolationists like Countess, GRAVEWURM, and Canada's Megiddo. Enter Devil's Whorehouse and let the ancient ritual begin!